On July 14, 2015, the New Horizons spacecraft screamed past Pluto at a relative speed of nearly 14 kilometers per second, giving humanity its first close-up very of the distant, icy world. At that speed, there was no hope of slowing New Horizons down; it would’ve had to carry an immense amount of fuel to do that, and we don’t have the technical capability to launch that much mass to Pluto. Also, it would’ve meant a much longer time to get to Pluto, and it took nearly a decade as it was! But this also means that the spacecraft is still zipping away from Earth, heading out into interstellar space. It’s not there, yet; it’s currently passing through the Kuiper Belt, a roughly doughnut-shaped region far out from the Sun and dominated by icy bodies very much like Pluto, itself. Most are small, but some are many hundreds of kilometers across. This was an opportunity too good to pass up. Astronomers looked for any Kuiper Belt Objects near the spacecraft’s trajectory, and, after using Hubble, they found one: Called 2014 MU69, it was a perfect target. Likely to be an ancient piece of solar system left over from its formation, it was reachable using some of what was left of the spacecraft’s fuel. The course correction was made, and New Horizons will blow past MU69 on January 1, 2019, passing just 10,000 km from it. But such a close encounter means more information must be known. How big is it? Are there rings or moons around it that could be a hazard during the flyby? 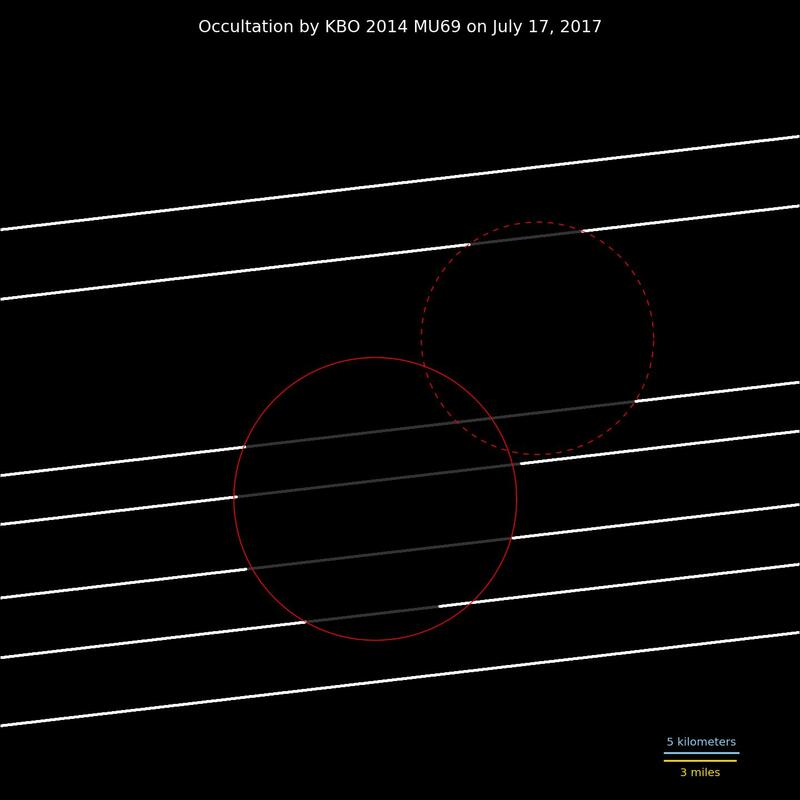 To find this out, the New Horizons team sent two dozen telescopes to South America to observe a predicted occultation of a star by MU69. On July 17, 2017, five of the telescopes saw the star wink out for a fraction of a second. Since we know how quickly MU69 is moving relative to the background stars, how long the star blinked out tells us how wide MU69 is as seen by that telescope. But there’s more: As I wrote in an earlier post, arranging the telescopes many kilometers apart in a north-south line allowed an estimate of the shape of the object to be obtained, as well. That wasn’t released at the time, but now New Horizons Principal Investigator Alan Stern has revealed it on his blog...and. apparently, MU69 may be a binary object! The way the star blinked out from different locations makes sense if MU69 is not a single round object, but instead two roughly round objects, either orbiting one another as a close binary system or touching each other in what’s called a contact binary. We’ve seen both of these types of objects before and, in fact, it’s common to see this in asteroids and comets (67P/Chuyurmov-Gerasimenko, the comet visited by the Rosetta spacecraft, is a contact binary). If this is the case, the two objects making up MU69 are about 20 and 18 km across. That’s a little bit like Pluto and its large moon, Charon, in fact; the moon is about half the size of Pluto. We think Charon formed after a massive impact blew debris from Pluto into space, and it coalesced into the moon. Perhaps something similar happened with MU69. Another, perhaps more likely, scenario is a slow speed collision between two objects caused them to stick, or at least lose enough energy to become bound gravitationally to form a binary. To be honest, we don’t know that much about objects this far away; they’re small and incredibly distant. MU69 is currently well over six billion km away from Earth, and the faintest star you can see with your naked eye is 15 million times brighter! It’s hard to learn a lot about such an object unless you go there. So, that’s what we’re doing. Right now, the New Horizons spacecraft is in hibernation to conserve energy, but engineers will wake it up this fall to tweak its path, then put it back to sleep until summer 2018. After that, it’ll wake up and start prepping for the encounter with MU69. And then, on New Year’s Day 2019, humanity will get its first close up look at primordial object from the earliest days of the our solar system. Or, as seems likely now, two primordial objects! What will we see?